Valeo’s new low-voltage (48V) all-electric prototype has make its world début at CES 2018. As countries and major cites become more and more intent on reducing CO2 emissions, this system offers a new angle on the future shape of urban mobility. The 48V all-electric tech demo was developed in partnership with Shanghai Jiao Tong University. The small two-seater electric tech demo car, which charges at any EV charging station, delivers a top speed of 100 km/h and offers a range of 100 km, is ideally suited to the short journeys and low speeds of urban driving. The 48V all-electric car is also, and above all, more economical (by 20%) than a high-voltage all electric solution, largely because it can do without some of the components and systems that a high-voltage system is required to have for user safety reasons. 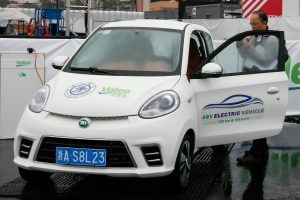 Pricing for a small 48V all-electric car could be as low as 9 000 dollars (around 7,500 euros). By making the all electric vehicle more affordable, this innovative solution could well lend further momentum to the electrification revolution. To develop its innovative 48V all-electric drive solution, Valeo has built on its experience and expertise in 48V systems for hybrid applications, a field in which it leads the market. World première at CES 2018 , this prototype marks something of a turning point for Valeo, because it is the first ever vehicle powered entirely (except for the battery) by Valeo systems. While Valeo had previously designed all the components needed for powertrain and drivetrain operation, it had never before designed the engine itself. So this car is actually Valeo‑powered, a development that opens up a whole new area of business and some bright new prospects.